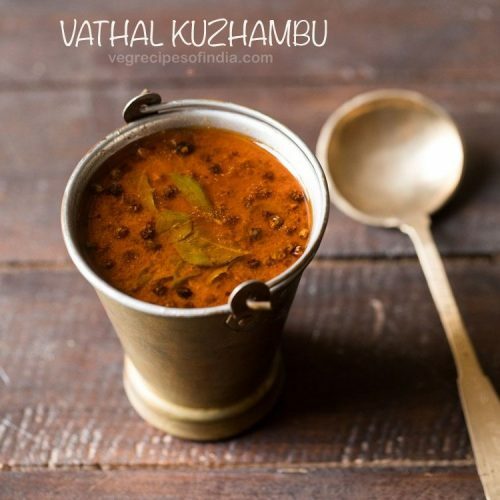 black nightshade tamarind curry recipe - south indian recipe of tasty and tongue-tickling kuzhambu made with sun dried black nightshade berries. these berries are also known as manathakkali in tamil language. in a bowl take 1 lemon sized tamarind ball or 1 tablespoon tightly packed tamarind. preferably use aged and dark tamarind. add 1 cup hot water. cover and soak tamarind for 20 to 30 minutes. squeeze the tamarind and extract the tamarind pulp in the water. keep tamarind pulp aside. heat 3 tablespoons sesame oil (gingelly oil) in a pan. keep flame to a low and add ½ teaspoon mustard seeds. keep the flame to a low and then add ½ teaspoon fenugreek seeds, 1 to 2 dry red chilies, 8 to 10 curry leaves and 1 pinch asafoetida (hing). fry and stir till the red chilies change color. keeping the flame to a low, now add 3 tablespoons manathakkali vathal (sun dried black nightshade). stirring continuously, fry for some seconds till the color of manathakkali changes. make sure you do not burn them. now switch off the flame and add 1.5 to 2 tablespoons sambar powder. fry for 1 minute switching off the flame. you can even fry at a low flame. but do make sure that the sambar powder does not get burnt. add the tamarind pulp and 2 cups water. give a stir. add salt as per taste. mix well and let this vatha kuzhambu come to a boil on medium-low flame for about 25 to 30 minutes. continue to simmer till the curry or gravy thickens slightly. you will see some oil specks on the top. then add 1 teaspoon rice flour. adding rice flour is optional and can be skipped. add ½ teaspoon jaggery. adding jaggery is also optional. mix well and continue to simmer vatha kulambu for 4 to 5 minutes more. after you switch off the flame you should clearly see a layer of oil after allowing the kuzhambu to rest for 1 to 2 minutes. check the taste and add more salt if required. serve vatha kuzhambu with steamed rice.